One of the most common types of roofing materials are shingles. While shingles are generally associated with asphalt shingles, they actually embrace a wider range of materials. Shingles include almost every roof cover type that does not involve a single material capping the entire roof. Hence, shingles could be made from different materials such as the common asphalt, wood, clay, tile and even metal. Each type of shingle has its corresponding costs in labor and materials. The costlier versions are the so-called impact-resistant shingles since they provide defense against leaks, create roof deck protection, improve the physical appeal of the house and enhance energy efficiency. The most common type of shingles used for roofing because they cost less than other materials and are relatively easier to install, which make them perfect for DIY practitioners. 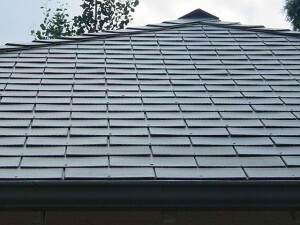 They are lighter than other shingle types, and therefore, more convenient to use. The cost of DIY asphalt shingles on a normal ranch-style house would range from $680 to $3,700. The cost variation depends on the design, material quality and roof size. Hiring a professional costs from $1,700 to $8,400. Metals provide the longest roof lifespan because they are durable and not affected by issues faced by other shingles. Its high cost but long life make metal suited for people intending to stay in their homes for a long time. Metal roofs cost from $5,100 to $22,000. Aluminum has a higher price range—$11,900 to $24,200. The cost of copper roofs range from around $25,500 to $39,600. Its natural look and durability make slate a favorite among homeowners. Indeed, larger houses usually have slate for their roofs. Costs vary from $17,000 to $84,000 for a 2,000 square-foot home. A 3,000 square-foot home will cost from $27,000 to $120,000 depending on location and design. People love tiles because they can be formed into different colors and shapes. They are also easy to replace if they are damaged. The cost of concrete tiles runs from $7,650 to $21,000. Ceramic tiles will cost around $11,900. If you want to customize the tiles, you will shell out a higher amount from $17,000 to $60,000. Wood shakes have more aesthetic appeal but require more maintenance because they deteriorate faster than other materials and are fire-prone. Insects and molds are other issues affecting wood shake shingles. The costs vary from $6,800 to $20,000. Synthetic or simulated wood shakes made from rubber or plastic, which provide better fire protection, cost around $12,600 to $18,900.